Address: Jupiter, 5, Puerto del Carmen (Lanzarote), Islas Canarias. 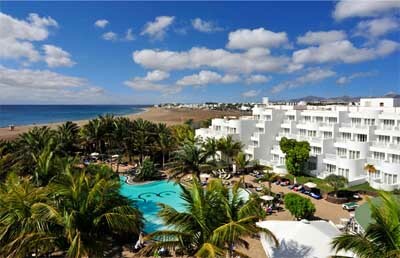 This 4-star hotel lies surrounded by tropical gardens, just off Lanzarote’s Pocillos Beach. Enjoy its wide range of outdoor facilities, including tennis courts and swimming pool – all bathed in year-round sunshine. La Geria looks out over one of the beautiful, sandy beaches found in the island’s Puerto del Carmen resort. Spend your day soaking up the sun on its 15 km of clean sand and clear, Atlantic waters. To cool off from the tropical sunshine, take a dip in the hotel’s huge outdoor swimming pool. Here you can also simply lie back on a sun lounger with a drink from the poolside bar. Relaxation can also be found in the hotel’s on-site sauna.